Discussion in 'iPhone and iPad Games' started by offworldgames, Dec 18, 2015. 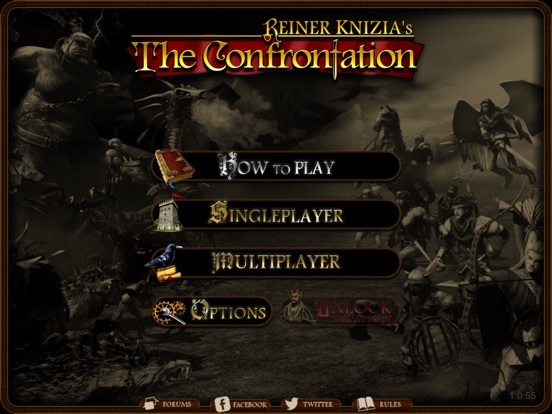 Hey all, our newest title, Reiner Knizia's The Confrontation just went live today! Update: 11/4/2016 - Variant Mode now available! It is with great pleasure that I report to the TA community that this fine game runs and looks great on iPhone 6+, under the proviso of a JB or other such enhancement. Just thought I'd inform those that are interested. No prob! The text in places is on the smaller side sometimes. Such as the quick description text when first click is done on a unit. But even that is passable. Stuff like that is something us ipad>iPhone conversionists mind little about. Really for the most part it looks exactly how it should on my 6+. Obviously can't speak for the smaller screens. I've had a short go through and it's looking promising. Can't wait to sink my teeth in to some knizia strategy. Pretty interested. Waiting on some imps on solo. I'll play 90% of the time in solo mode. Looks like it could be fantastic! Too bad it didn't get to keep the Lord of the Rings theme but I'm still glad to have this in digital form at my beckon call. There is an unlock for "variant mode". Can I ask what is that? And how is it unlocked? Because it's greyed out for me currently. I've only played one game, and I played as the light side. I started by playing the tutorial. It's concise, short, and simple. It's well made, but Yeh, short. But then again, the mechanics of this game seem easy to grasp, like most knizia games (does "easy to learn, hard to master" ring a bell?). What had me confused is that the end of the tutorial the character said something like "well that's the basics covered, now see if you can finish off your game". The whole time after that I was thinking like "oh ok that was the basics, I guess next tutorial we'll cover the advanced?". Well that wasn't the case, as that really was the end of the tutorial. Anyway, in general, graphics are reasonable, quite good, just a little edgy. Better graphics really aren't required anyway, as it's the mechanics of the game that's important here. The Sound is fine, again, nothing major required here anyway. At the start you place your characters in the tiles (check the screen shots). I'm not sure how much depth there is to placing what character in what tile, but I'm assuming there must be some. Having only played one game, my first placement was random. BTW, the ultimate goal of playing light side is to get the prince to the other end. Each character that you place usually has some modest special text like "automatically defeats goblin...somethings". Or "can switch places with the prince if he is attacked.....". Therein these texts is where some aspect of strategy is introduced. Also, you start with a hand of numbered cards (1 to 5 or was it 6, plus 3 or 4 special cards). Each time you ATTACK or the enemy attacks, you must play one card. And that's the next part of the mechanics. Cards 1 to 6 boost your characters strength by that amount. So when to use which card? And once played that card is gone forever (sort of). This mechanic gives the game a little bit of a "risk" feel. Ie how much "resources" to apply under which circumstances. 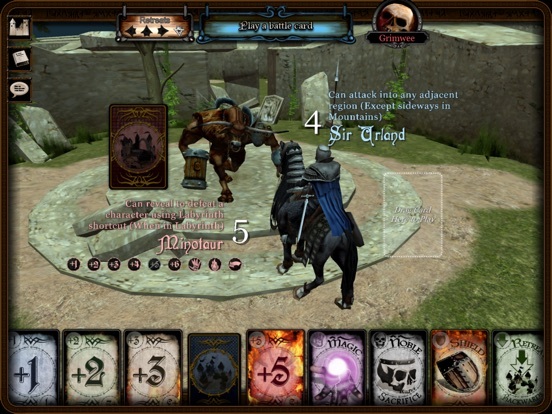 The special text cards also in your hand during battle could also be played. One such card read "play a previously used card", meaning you could whip that 6 back out if you've played it already. So from there you'll notice the game is all about making risk-esque choices. 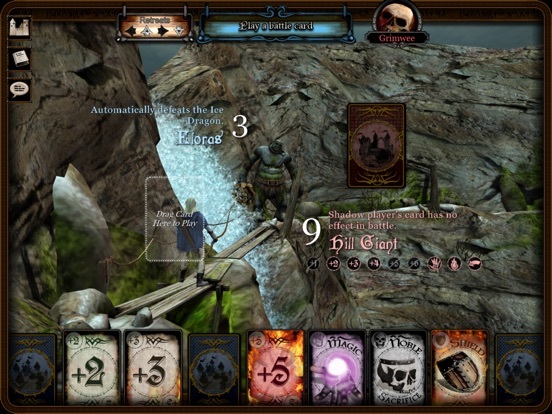 Noting the surrounding enemies, noting your characters abilities relative to the enemies (which btw are under a "fog" so you can see their true unit type until revealed). Finally, you as the light side have two special effect cards (I don't know the technical names of these). These can only be played during your turn. 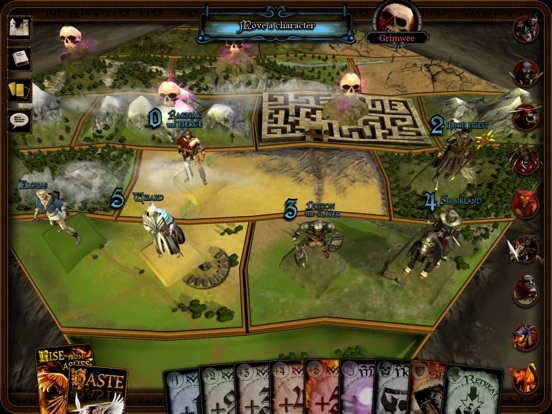 For example one card reads something like "revive a wizard on certain tile". Meaning you've got one wizard up you sleeve if needed. You advance up the tiles while the dark side advances back at you. Also, you can play as the dark side. I haven't yet, so there's some change up of strategy there I'm sure. Anyway, if I were to sum up, this seems to be another neat little knizia game with the wrapping of a lord of the rings type paint brush. Please don't go in thinking this is an uber deep, uber collector card build a deck, and build an army of horse riders and archers for an epic table top clash. On the contrary, this is a typical knizia game, with a controlled ruleset and finite card/character mechanics. I'm only one game in, it's likely got the easy to learn, hard to master thing going on. I aliken it to a knizia-risk board game. Recommend youtubing some gameplay if there is any out there. Anyway, that's it from me after my one game in summary. Time to hit up some dark side play. Character placement can feel a little random at first, but once you get accustomed to the character abilities you'll find that there's a lot of room for experimentation. For example you might initially start placing Ragnar the Fierce (whose ability causes both characters to be defeated in battle) near the front lines, but eventually prefer to hold him back a bit for use in the middle or end game. The variant mode introduces 18 additional characters and 4 new special cards. These were funded in part by the Kickstarter and we hope to have a beta version ready by the end of January (rolling them out live shortly after). Great first imps Talbs. What with yours and pocket tactics review I'm going to have a crack at this. Can't help myself. I've got to give this a try. Thanks to all for the good insight! I'm waiting for a review an the extra content before diving in. Hey everyone, just a quick note that we pushed a new version (1.0.41) yesterday. 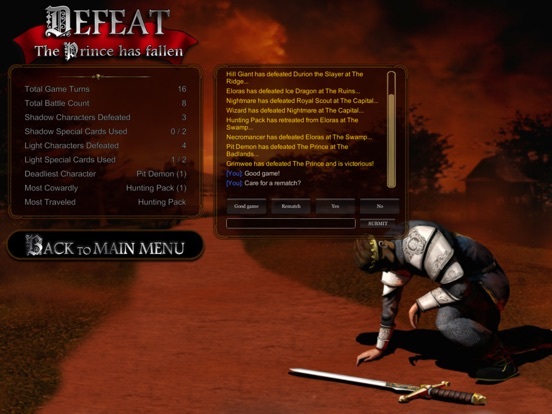 The update includes gameplay fixes and added battle effects. Just a heads up that the Variant character beta started last week, here's a few screenshots of some of the new ones... stay tuned for more!